When you hear the name Mark Jones, you may think of numerous things. Among those are probably the names of one of NINE restaurants he owns in Columbus, GA and surrounding areas. While he's been at it for a long time (Hunter's Pub is almost 20 years old! ), his menu only seems to get better and better. We put out a survey, took the 87 responses and tallied them up! The results are below. Smoke is a Bourbon, Beer and BBQ restaurant in Uptown Columbus that offers a modern twist on traditional southern BBQ. Expect some of your homestyle BBQ favorites with unique pairings of flavor and craft cocktails! This delicious appetizer was number one on the list of fan favorites! These come house made with jalapeño and bacon dipping sauce. Yum! This sandwich is served with one side. Which yummy side? Well that's up to you. Enjoy smoked beef brisket with BBQ 1000 island, sauerkraut and white cheddar on sourdough. Taco's in a BBQ place? You read it right! They are filled with beef brisket with pineapple cilantro slaw, pickled onions and house sauce. These tacos fit right in. The Black Cow brings a laid back rustic southern charm to Uptown Columbus. Whether you order this for a side dish or dessert, it will be amazing. You're looking at the number one fan favorite at The Black Cow. There's not much to say except this meatloaf is "udderly" delicious! Named best burger in the South by Garden & Gun magazine and also on Explore GA's "100 Plates Locals Love", this burger is a must try! It comes topped with house made pimento cheese, bacon and jalapeño jelly topped on a toasted bun. No wonder it's a fan favorite! This restaurant is the go to place for Breakfast and Brunch in Uptown Columbus. Serving chicken - any way you like it. Biscuits, Eggs, Sandwiches, Wraps, Salads and more. The chicken coop is everything breakfast on a plate! Served open face wth chopped, grilled, or fried chicken, sausage gravy, cheddar cheese, bacon and an over easy egg. We have tasted and agree that this plate has earned it's place as the number one fan favorite. Fried chicken, pimento cheese, bacon and jalapeño jelly. Do we even need to say anything more? Simple but classic, sausage gravy on delicious biscuits is never a bad idea. This is a "fast casual" restaurant in two locations! Macon Road and Williams Road. The Williams Road location even delivers! This entree comes loaded with mushrooms and onions. Sometimes you just want a hand made burger and when those times come around it's time for a visit to Ready Steak GO! Smothered with onions and gravy, this dish will definitely leave you satisfied. Coming in as the third fan favorite, it's definitely worth a try. Located in North Columbus, Mark’s City Grill prides itself on serving uniquely pleasing dishes with extraordinary flavor. With a lemon butter sauce that will melt in your mouth, this dish is a personal favorite of ours. We can see how it is the number one fan favorite! 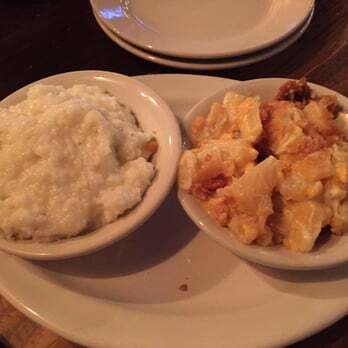 We recommend you order macaroni and cheese as your side dish. We think it's the best in Columbus. You can't go wrong ordering this meal. With mashed potatoes and grilled veggies, it's a pleaser. Sautéed shrimp and Andouille sausage in a cream sauce over white cheddar grits. Even reading that makes our mouth water. Mark’s Pies & Thighs is located in Cataula, GA. Serving Breakfast, Lunch and Dinner from bone in crispy fried chicken and mouth watering pizza pies to delectable burgers and juicy chicken wings, food lovers can opt to use the convenient drive-thru window or sit down in the dining area and indulge in some of the best food in the south. Choose from two or three piece dark, mixed, or white chicken. They even have a family deal! This pizza has everything on it, pepperoni, ham, sausage, onions, peppers, black olives, tomatoes, mushrooms, and banana peppers. We can see why it's a fan favorite! Chicken dipped in Mark's special sauce. Really, who could ask for more? Delish. Located in Hamilton, GA, Hunter's Pub has been making customers happy with it's wonderful food since 1998. Not only do they have steaks but also "Fresh Catch Of The Day" specials that are truly one of a kind! Hunter's is the best place around for a good ole steak. You can choose from a 16oz Ribeye, 14oz New York Strip, 12oz Filet, or a 8oz Petite Filet. The picture speaks for itself. These babies are definitely worth a try. This might be the best dessert in all the land. No joke. There you have it! Fan favorites from seven of the nine Mark Jones restaurants. Did your favorite make the list?